The first idea for this book I had already in 2012. Hoever, I did not consider my thoughts on the subject of DevOps & Continuous Delivery as relevant enough to be presented to a readership. After all, there were already publications on this topic, both from a technical point of view (continuous delivery) and with regard to the soft factors (DevOps culture / CALMS). Since then, however, I had been in contact with major IT organizations, where the introduction of DevOps has been triggered without being considered as strategically relevant. In other cases, the introduction of the DevOps was started with a false expectation. This has led to the fact that instead of lifting the potential of DevOps, only money has been burned. According to these experiences, I summarized my experiences and insights in the present book „DevOps Strategies“. DevOps and Continuous Delivery have the potential to redeem an old promise from the IT industry, namely to make the software factory come true. This means the creation of software releases as part of an automated production chain and seamless deployment of the releases into the production environment, enabling the delivery of software products to the customer at a high frequency and with an appropriate quality. When DevOps is introduced to IT service providers, this is not done on the greenfield, but in established organizations with embedded processes and workflows. These are often structured according to proven procedures and processes described in ITIL. 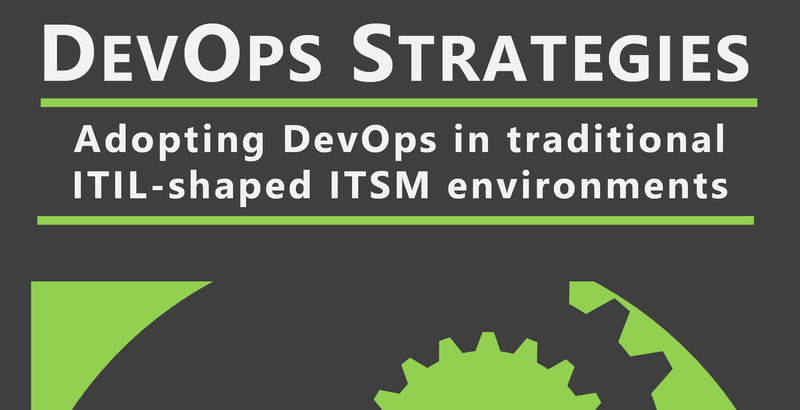 DevOps Strategies attempts to identify strategic options available for the integration of a DevOps culture and the introduction of Continuous Delivery Pipelines into IT service organizations. For large IT service organizations, DevOps, in combination with Continuous Delivery provides the possibility of replacing offshoring relationships, which are affected by friction losses, by efficient in-house developments. Savings in capacities of software testers. DevOps (Development-to-Operation) is a philosophy or mindset intended to help bridging the gap between the IT service management (referred to ITSM, usually organized using ITIL best practices) and the software development. The term DevOps is composed of the two terms ‘Dev’, for (software) -development, and ‘Ops’ for operations. The combination ‘DevOps’ symbolizes the convergence of both areas. However, the implementation of a ‘DevOps philosophy’ requires a set of best practices like test and build automatization as well as continuous integration and delivery. Although these best practices also exist independently from DevOps, this book presents refers to them as „DevOps Best Practices“. The IT Infrastructure Library, referred to as ITIL, consists of five books that contain best practices about how to organize and design processes, workflows and functions in the area of IT Service management. Although ITIL is sometimes referred to as “framework”, when this book talks about ITIL, it is referring to it as a collection of best practices in IT service management. In general, ITIL and DevOps are of different nature and are, according to some person’s opinions, incompatible which each other. Thus, one of this book’s intentions is to show that it is possible to integrate DevOps principles and best practices into an organization or environment based on ITIL-best practices. Although the sets of best practices covered by ITIL and DevOps are disjunctive, they complement each other in the way that an organization must analyze and adapt its processes based on ITIL best practices when adopting DevOps. A general assumption on which this book is based is that ITIL Best Practices are already firmly established in the company when DevOps principles are to be introduced. In doing so, this book describes DevOps and ITIL Best Practices to the extent that it is necessary for a comprehensive understanding of DevOps and ITIL. This shall also show the relations between them. In my opinion, those who believe that ITIL and DevOps are not compatible with each other overlook the fact that neither ITIL nor DevOps are a doctrine of absoluteness. While ITIL focuses on many aspects of IT service delivery and IT operations, DevOps, in conjunction with its best practices (such as Continuous Delivery), has an impact on the entire software creation and the subsequent transition („roll-out“) into production. If you want to establish DevOps in an organization that already uses ITIL Best Practices, DevOps will have an impact on all ITIL Life Cycle stages (see Part 3 in this book). This applies in particular to the Life Cycle Stages Service Design and Service Transition, but also, but less strongly in the Life Cycle Stages Continual Service Improvement, Service Design and Service Strategy.